WASHINGTON — A White House list of what it calls underreported terrorist attacks did not support President Donald Trump’s claim that the media are downplaying a “genocide” carried out by the Islamic State group. But it did shine new light on the difficulty in defining the scope, source and motives behind the violence carried out in the name of radical Islam. A close review of the 78 attacks listed by the White House shows almost all the attacks were reported by the news media and that many were widely covered by local and international outlets. The review, carried out by Associated Press reporters on four continents, found that more than half of the attacks, including most of those in the Middle East, were linked to the Islamic State group, as the White House suggested. Others were ruled IS-inspired, but carried out by lone wolf attackers. But in some cases, the motive was unclear, and investigations as to possible extremist links were inconclusive. The examples range from knife-wielding assailants in Texas to hostage-takers in Australia to the gunmen who killed at least 129 people across Paris in 2015. The magnitude of the attacks on the document circulated by the White House — which appeared to be hastily compiled and included several typos — ranges from several dozen dead to one or two people injured. It has some notable omissions. It did not include any attacks by Boko Haram, an Islamist insurgent group operating in West Africa that is responsible for far more deaths than the Islamic State. The group, which has pledged allegiance to the Islamic State, has led an uprising that has killed more than 20,000 people and left 2.6 million homeless this decade in Nigeria and neighboring countries. It also pays little heed to the scores of terror acts that have plagued nations like Syria and Iraq that are close to the Islamic State’s caliphate and under near-daily siege. The list itself was created to bolster the case for Trump’s executive order restricting immigration from seven Muslim-majority countries and suspending the U.S. refugee program. But that ban would not have prevented any of the terrorist attacks on the list that occurred in the United States. The inclusion of some of the attacks in the United States defies credulity. Among those on the White House’s list are a deadly rampage in San Bernardino, California, in 2015 in which 14 people were killed and 21 injured, and the June 2016 nightclub shooting in Orlando, Florida, which left 49 dead, the biggest mass shooting in the nation’s history. Both of those attacks received blanket news coverage for days, and all of the attacks in the U.S. received at least some attention by the American media. A 2015 attack in Garland, Texas, took place outside a venue hosting a provocative contest for Prophet Muhammad cartoons. According to trial testimony, the suspect, Elton Simpson, was an American Muslim who became the subject of a criminal investigation in 2006 because of his association “with an individual whom the FBI believed was attempting to set up a terrorist cell in Arizona.” He was never found to have links to the Islamic State group or any other established radical groups. Non-fatal knife attacks on police officers in Boston and New York, a knife attack at a Minnesota mall and the shooting of a police officer in Philadelphia were also reported. Two October 2014 attacks in Canada — one in Quebec and one in Ottawa — received media coverage in Canada, where attacks of this nature are rare. In Quebec, soldier Patrice Vincent was killed in an apparent act of homegrown terrorism. The suspect was known to police and had his passport seized to stop him from traveling to Syria. It was never determined whether the suspect had any ties to Islamic militant groups, though former Canadian Prime Minister Stephen Harper described the suspect as an “ISIL-inspired terrorist,” referring to the Islamic State group by an acronym. In the Canadian capital, one soldier was killed at a war memorial and two were wounded in shootings at the Parliament building. Meanwhile, in Quebec last week, a gunman who reportedly held anti-immigrant views killed six men at a local mosque in an incident described by Canada’s Prime Minister Justin Trudeau as a “terrorist attack.” Trump has yet to personally comment on the attacks, although the White House did offer assistance to Trudeau. That attack wasn’t listed. Across Europe, attacks are increasingly being attributed to the flow of refugees across the continent — and it’s hard to find a single attack, large or small, that didn’t generate global coverage. All of the attacks cited on the list in Europe were widely reported both by international and local media — some in real time. A 2015 attack at a Paris supermarket was covered live as it was happening. When the attacker, Amedy Coulibaly, pledged allegiance to the Islamic State group, it was urgently reported by The Associated Press and others. Links between the attackers and terror groups were also reported, although at times that did not happen until they were unearthed by investigators days later. In London, a 2015 knife attack by a man shouting “this is for Syria” at an underground rail station made headlines in newspapers around the world. Police said they treated it as a terrorist incident, although a link was never drawn between the attacker and any particular group. A 2014 attack on a police station by a Muslim convert in Joue-les-Tours, France, was reported by The Associated Press at the time and followed up with his brother’s arrest in Burundi. AP did not report on any links to the Islamic State group, although British media later said he posted a black Islamic State flag on his Facebook page. The Muslim world is the front line in the battle against the Islamic State group, and civilians across the region have not been spared the group’s deadly campaign. A number of attacks cited on the White House list occurred in Egypt. A 2015 attack on a camp used by a multinational peacekeeping force was reported by several news outlets, as was the Islamic State group claim. Other attacks occurred in Cairo in 2015, including one that resulted in the kidnapping and beheading of a Croatian national, and a car bomb at the Italian Consulate that left one dead. Both were claimed by the Islamic State group and reported worldwide. Additional attacks in Saudi Arabia, Jordan, Tunisia and Turkey were also reported by various news outlets, citing officials who linked the attacks to the Islamic State group — a common claim by governments across the Middle East, even when dealing with lone wolf attackers. The White House list did not include any attacks in Iraq, Syria or Yemen, where civilians are targeted almost daily by militant attacks. Many of those attacks are covered by the media, despite the often-perilous conditions involved in reporting those stories. Included on Trump’s list is a standoff at a Sydney chocolatier in 2014. The incident drew round-the-clock coverage by the world’s news outlets. A request by attacker Man Haron Monis for an Islamic State group flag during the faceoff fueled anxiety about the group’s expanding influence across the globe. Monis himself was never determined to have had contact with the group. An incident shortly before that in Melbourne also made headlines when Numan Haider was shot dead by police in connection with the stabbing of two police officers. Photographs on Haider’s Facebook site included images of what appeared to be members of the Islamic State group. Lemire reported from New York. Geir Moulson in Berlin; Jan Olsen in Copenhagen; Jill Lawless in London; Vladimir Isachenkov in Moscow; Dominique Soguel in Basel, Switzerland; Adam Schreck in Dubai, United Arab Emirates; Rob Gillies in Toronto; Lori Hinnant in Paris; Andrew Meldrum in Johannesburg, South Africa; Rahim Faiez in Kabul, Afghanistan; and Leon Keith in Bangkok, Thailand, contributed to this report. 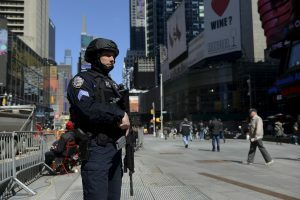 Left: A member of the NYPD Joint Terrorism Task Force patrols in Times Square. Credit: REUTERS/Stephanie Keith.